Villa Rosa is a located in the Dawn Beach area, which is one of the most beautiful places to stay on the island of St Maarten. The Atlantic Ocean is right out your window, along with a view of St. Barth’s Island. Enjoy the ocean breezes and as you refresh and revitalize in this amazing location. And when you’re ready to explore the island, take in all the sights and sounds of the full tropical island experience! 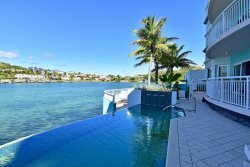 This modern villa also provides you with 3 master bedrooms all with en-suite baths that give you the gorgeous views of the ocean, as well as the Italian style kitchen that brightens up the open concept villa. There are large windows throughout, showcasing the immaculate views that St. Maarten has to offer. The pool and deck add privacy for you to enjoy the lovely view as you are soaking up the sun! 1 Master bedroom with en-suite bath, double sinks and 3 way shower, offering expansive ocean views. 1 Master bedroom with en-suite bath, with Jacuzzi and shower, offering expansive ocean views. 1- Master bedroom with en-suite bath with walk in-shower, offering more limited ocean views. Peak Season: 1 Suite $3550. / 2 Suites $3850. / 3 Suites $4050. Low Season: 1 Suite $2850. / 2 Suites $3050. / 3 Suites $3150.